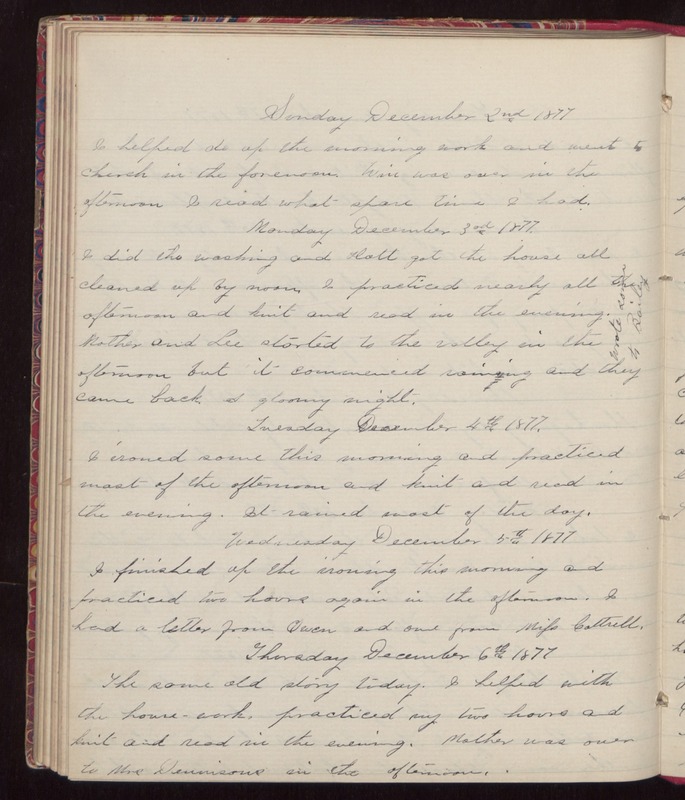 Sunday December 2nd 1877 I helped do up the morning work and went to church in the forenoon. Win was over in the afternoon I read what spare time I had. Monday December 3rd 1877. I did the washing and Hatt got the house all cleaned up by noon. I practiced nearly all the afternoon and knit and read in the evening. Mother and Lee started to the valley in the afternoon but it commenced raining and they came back. A gloomy night. Wrote some to Bailey. Tuesday December 4th 1877. I ironed some this morning and practiced most of the afternoon and knit and read in the evening. It rained most of the day. Wednesday December 5th 1877 I finished up the ironing this morning and practiced two hours again in the afternoon. I had a letter from Owen and one from Miss Cattrell. Thursday December 6th 1877 The same old story today. I helped with the house-work, practiced my two hours and knit and read in the evening. Mother was over to Mrs Dennisons in the afternoon.